If you are a New Jersey winemaker, or planning to become one, it’s likely that you’ll be making your wines from fresh wine grapes, wine grape juices, or both. Grapes N’ Barrels now offers a rapidly growing new winemaking alternative: Frozen Grape Must or simply Frozen Must. Background: Grape must is comprised of the pomace that remains after crushing and destemming wine grapes. A while back, it occurred to grape growers and distributors that the distinct advantages of frozen must could make it a marketable product. The concept was plausible, but the cost of production, shipment and storage of frozen must, tended to slow early adoption. Over the past decade, the interest in making ‘home-made’, or ‘artisan wines’, has grown steadily. Perhaps motivated by heritage, family tradition, the desire to understand the mystery of winemaking, or just plain old love of wine, more and more people are exploring the fascinating world of making their own wine. Amateur and experienced winemakers have become increasingly discerning about the source and quality of fresh grapes or juices, whatever the state or country of origin. Thus, a market for high-quality grapes for producing one’s own premium wines has continued to grow. Another development in the personal winemaking segment has been the advent and rapid growth of ‘kit wines’ and ‘wine juices’ that encompass many varietals and blends ranging in price from moderate to very expensive depending on the region/country sourced and quality. Importantly, the availability of quality wine juices has enabled winemakers to eliminate some winemaking steps and also offers the added benefit of being able to make wine anytime. As a result, it is now very common to find many winemakers interested in and/or making wine all-year-long. The demand for high-quality fresh grapes coupled with notion of circumventing seasonal requirements to make wine has made frozen wine must a very legitimate and intriguing new way to produce excellent wines. Fresh Grapes: While using top-brand fresh wine grapes is the preferred method to produce the best wines, results are never exact or guaranteed by even the most experienced vintner. Key ‘grape’ factors impacting wine outcomes include: Terroir (if known), time in shipment, grape exposure during shipment, mold and bacterial growth, and chemical treatment for shipment. Any one, or all of these factors, can negatively impact the quality of the grapes used to make wine. Using bad grapes, leads to bad wine. Then, we can add to that the human element affecting wine outcomes which includes the winemaking process that is followed as well as the level of oversight and care taken by the winemaker. Good grapes used in a flawed or bad winemaking process, leads to bad wine. For the record, there is no intention to challenge the use of fresh grapes for making your own wine. The purpose here is to point out some of the typical challenges faced by all New Jersey winemaker’s when using fresh grapes that are shipped from California, Italy, Chile or anywhere else. That is why winemakers always want the ‘first picked/first to arrive’, ‘best quality’ grapes, harvested at the ‘correct ripeness’, shipped refrigerated and handled delicately to avoid deterioration in transit. Good grapes used by good winemaker, will always lead to good wine. There is no doubt, using the best fresh wine grapes is the winemaker’s first choice for making wine. Unfortunately for New Jersey winemakers, fresh wine grapes can be affected during shipment and they are only available from Chile in spring and from California/Italy in the fall. Wine Juices: As well, an argument can be made as to why ‘wine grape juices’, fresh or frozen, are ideally suited for certain types of wine making. Juices eliminate winemaking steps and can result in a drinkable wine sooner. 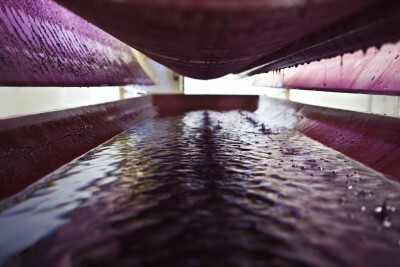 Certainly, the process for winemaking is condensed using juices and for some winemakers the process is more predictable. But, wine grape juices eliminate aspects of the wine making process that have a direct impact on the outcome. When using fresh wine juices, the winemaker forgoes some important control. That is, maceration and tannin extraction are minimized, so color and taste are affected to some degree. Perhaps for white wines these two key wine making steps are less likely to impact the wine… but, for red wines, the elimination of these steps can lead to a loss of certain inherent wine characteristics. Wine juices are convenient in that the winemaker does not have to crush and press grapes. But to forego maceration, especially for red wines, is a sacrifice that has consequences. With less color and tannin extraction from grape skins, seeds, and stems, you can expect to lose some degree of the wine’s personality. Enter ‘frozen grape must’! Understandably, not a new wine-making approach, frozen must is gaining in popularity for a number of reasons. Clearly the benefits of using frozen must offers good insight into why the frozen must phenomenon is growing and is offered and promoted by Grapes N’ Barrels. Top quality ripened grapes, from named vineyards, picked-crushed-frozen the same day, processed in large quantities. Expect consistent quality. Frozen must is stable during shipment, no chance of dehydration or spoilage. Winemaking steps are exactly the same as when using fresh grapes, with the exception of crushing grapes. The winemaker controls the process and desired outcomes. The negative effects of wild yeast, bacteria, and fungus are virtually halted. As the must thaws over several days, cold maceration takes place which allows for optimal color and tannin extraction. Key information provided: Vineyard is identified, documented brix, pH, TA (titratable acidity) and harvest date. The source of grapes and ‘key measures’ are known before fermentation. Frozen must is available in most popular red varietals… and, popular white varietals. You can make wine when you choose to make it… all year long. Frozen must affords winemakers all the advantages of using fresh grapes without the potential quality risks associated with fresh grape shipment. Frozen must gives the winemaker better wine outcomes than wine grape juices, and it too is available throughout the year. Pricing: Fresh grapes provide the full winemaking experience and if they are of high-quality when crushed, they will undoubtedly produce a great wine at a somewhat lower cost. Although shipping and production costs have come down, the crushing, packing, storage, and shipping make frozen must a bit more expensive. When comparing the two, selecting frozen must avoids the chance of receiving inferior and/or deteriorating fresh grapes. The price differential is justified based on the quality assurance when using frozen must. Wine Quality: One final word about the quality of wines resulting from frozen must. One may argue that using frozen must can’t possibly produce the same quality of wine that can be had with fresh grapes. Of course, it is true that freezing anything organic may change some aspects of its physical and chemical nature. However, the effects of freezing grape must are minimal and unnoticeable in wine production and outcomes. The fact is, you can produce a quality wine with frozen must that is comparable to those made with fresh grapes. So, if you want to make an Italian Sangiovese in January, a California Merlot in May, or an Alexander Valley, CA Cabernet Sauvignon in July… frozen must makes it possible for you to do so. Grapes N’ Barrels is the place to come make wine with frozen grape must any time of year! Grapes N’ Barrels offers New Jersey winemakers ‘frozen grape must’ for making their wines. We are uniquely experienced in the process, we have one of the best sources for frozen must in the U.S., and we are capable of making excellent wines year-long. To learn more, call Joe Guarino 732.851.6800 today!